There is an ongoing debate among policy makers, international donors and researchers about how to provide energy access to poor rural areas. For many years, most funding was flowing into large-scale infrastructure projects to expand national electricity grids. However, grid extensions to remote and poor areas are expensive and difficult to maintain. At the same time, concerns about climate change combined with the decline in solar photovoltaic and battery prices have made solar-powered electricity an attractive investment. Off-grid energy as key to fight poverty? In particular, pico-solar products, such as small portable solar lights, have gained increased policy attention and international funding. Such products have low up-front costs, need little maintenance, and do not pose the management problems typically associated with national grids or even mini-grids. 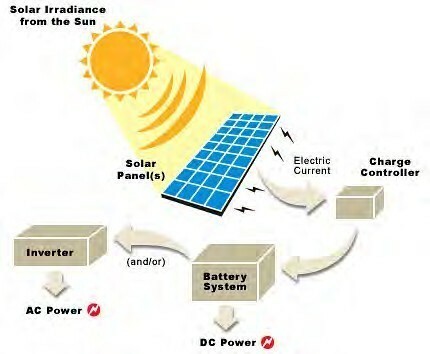 Solar photovoltaic charged products are hence seen as a possible solution to address both energy poverty and energy sustainability in the near future.Solar lanterns could replace kerosene lighting, which is still used by an estimated 500 million households. The emissions of kerosene lights contribute to global warming and to severe indoor air pollution. Moreover, kerosene lamps typically provide low-quality lighting, at around 10 lumens, while for example a standard LED lamp provides around 500 lumens. On the other hand, solar lanterns only provide minimal access to energy: they can’t power radios, TVs, fridges, or other appliances people may aspire to own as they become wealthier. Whereas researchers agree that access to grid energy is important for economic growth, there is only scarce empirical evidence of the impact that off-grid energy access has on poverty. That’s why we conducted a policy field experiment in Kenya in collaboration with several policy partners. We analyzed the demand, use and effects of small portable solar lights, combining survey data with sensor data developed by the ETH spin-off Bonsai Systems. At the start of our experiment, almost all 1,400 surveyed households used small kerosene (tin) lanterns with an open flame for lighting. A typical household spent 5–10% of its total cash expenditure on energy, mostly used for kerosene. In comparison, European households spend on average around 4% of their total expenditure on energy, but use more than five times more energy. We found a high demand for solar lanterns among poor rural households, but noticed that they responded very strongly to variations in cost. At the current market price of 9 US dollars, 29% households bought a light; if lights were sold at a subsidized price of 4 dollars, the demand more than doubled (69%). A solar light typically replaces one of the households’ kerosene lanterns. As a result, households save around 2% of their overall monthly cash expenditure by spending less on kerosene. We found little evidence that access to better lighting improves children’s performance at school or increases adults’ working time. If only direct economic returns are considered, this would suggest that switching from kerosene to solar lighting might not always be cost-effective. However, this result might change if kerosene prices increase or photovoltaic prices further decrease. Solar lanterns nevertheless reduced kerosene consumption by half and lead to a reduction in emissions, which helps in terms of climate change as well as indoor air pollution. We observed fewer symptoms of dry eye diseases and respiratory infections, which are often related to air pollution. Households might not take into account these positive environmental and health externalities when considering whether to buy a solar lantern and might hence underinvest in solar lanterns – a typical market failure. Policy makers could take steps to address these failures by temporarily subsidizing solar lights in order to improve lighting and reduce kerosene emissions and related health issues. This approach looks particularly promising given that households who received a subsidized solar lantern used it just as much as households who had to pay the market price for it.